Increase the material’s tensile strength, barrier properties, clarity. stretch blow molding produces a container from less raw material and with improved economics and bottle properties. limited to hollow parts; wall thickness is hard to control. Numerous standard rules apply to the design of blow molded parts and are valuable in preventing serious problems and complaints in the manufacture or use of the item. The unique features of the blow-molding process eliminate the need of costly assembly of parts such as found in injection molding, but special care must be exercised in part design. The selection of raw materials offers many advantages in properties and design, since the extrusion process is capable of handling high molecular weight polymers. This is not always true in plastic process equipment that relies 011 the injection of a molten material into a closed mold. 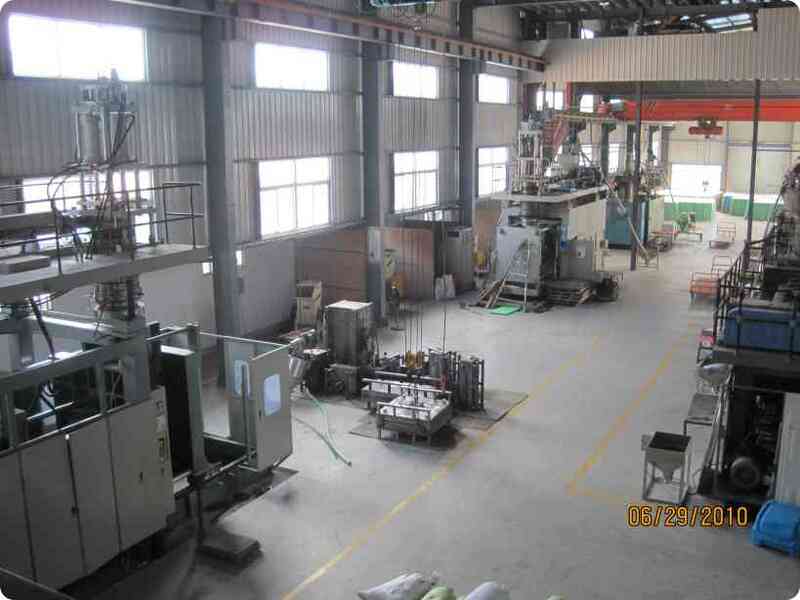 The injection process, by necessity, uses thermoplastic materials of lower molecular weight and consequently reduced toughness and stress-crack resistance. Applications that do not require optimum stress-crack resistance may be better suited to injection blowing than to extrusion blowing to obtain reduced weight through more uniform wall thickness- Part design that utilizes a shape such as a pyramid or cone will usually result in an item of less weight by injection blowing than by extrusion blowing. Details of design, such as angles, edges and comers, are of significance in blow molding. Sharp angles and sharp edges must be avoided and fillets and rounds should be employed in all comers and ribs. The use of a generous radius in all these design areas will prevent excessive thinning of the plastic and prevent molded-in stresses. In applications such as detergent containers it is important to employ generous chime radius to prevent thinning. The extremes of a heavy bottom pinch-off section and a thin bottom comer can result in stress cracking of the container. The necessity for, and the problems in obtaining, uniform wall thickness in blow molding causes the molder to consider many special techniques. Some of the concepts to be reviewed in this section are production realities while others have yet to be reduced to practice. Each idea is unique in its own right but each is designed to yield a blow-molded part that has a wall thickness more uniform than that produced by the standard extrusion blowing process. Injection blowing is of course not as restricted in this regard, since the injected parison can be produced with varying wall thickness. This is because material is first injected into a closed mold and thickness is controlled by core and cavity mold dimensions. In using this concept one has only to use a thicker wall for the sections of the part that must undergo the greatest blow-up ratio. Elliptical parisons for rectangular shapes in blow molding are a practical reality• The extruding of an elliptical shape by using an elliptical pin in the tubing die will place extra material in critical areas needed for high blow-up. The shape or design of the die pin can be tailored to give the material thickness profile desired. This concept of special design can be used on practically any blow-molding machine, regardless of style. Parison temperature control to yield hot and cold sections in desired areas will produce controlled non-uniform stretch of the tube- The strategic location of cool air jets will set the tube and prevent excess thinning in these areas. Parts such as a narrow-neck, wide-bottom flask will require circular jets to chill the full circumference of the parison to prevent out-of-roundness of parts. The cooling force should be directed toward the area that is to have the greatest blow-up ratio. Parison temperature reduction can also be used to produce parts with a heavy side for industrial applications such as housings. This is done either by the use of cooling air or by allowing the back of the parison to chill against the mold before blowing. In this case the heavy wall of the part can be used for attaching or mounting the blown unit to a frame or wall. 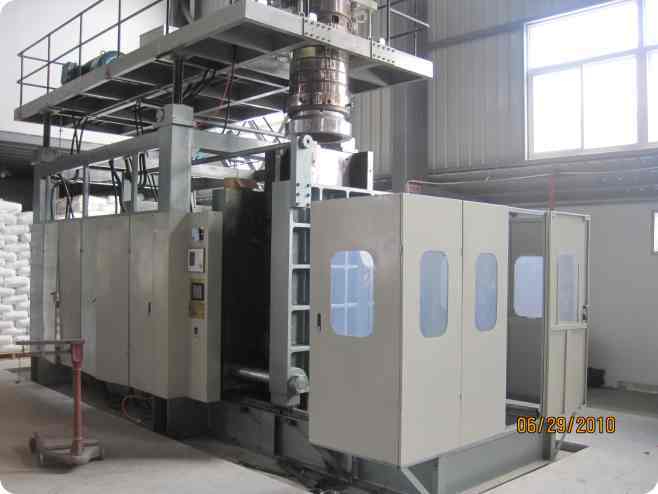 This concept of blowing can be utilized on most blow-molding machines. Pulsation of the parison tube is a third means of producing a nonuniform parison thickness for preferred wall thickness control- In this case a special head of the piston type is necessary to yield controlled pulses in the tube. Timing must be such that the thicker ring section of the parison coincides with the area in the part that will undergo maximum blow-up. Parison sag can be used advantageously in machines of the freefall parison type to yield parts of more uniform wall thickness. The natural sag of the extruded tube will cause it to thin near the top and consequently place more material in the bottom of the mold- This concept has been used advantageously in container production to strengthen the bottoms of parts that must pass drop impact tests. Offset openings are most readily produced on rising mold type machines. The further refinement of tooling to incorporate a spinning mandrel will also allow the molding of internal threads on the necks of containers, using either an offset or center opening. Trapped objects such as a small bell inside a blow-molded rattle can be accomplished when blowing over a mandrel- The object to be encapsulated is placed on the mandrel or blow pin and is blown into the part with the air. Inserts in blow molding can be either of the solid or washer type. Washer inserts are used by placing them around the air mandrel and pulling the plastic over it during the blowing operation. Solid inserts must be locked in the part by means of an undercut. This can be done by mounting the insert in the mold and allowing the plastic to blow partially around the insert head-For applications such as screw-driver handles the blade is mounted in the mold through the pinch o任 area and the plastic is compressed on the shaft. The blade section in the plastic must have flutes or ears to prevent slippage during use of the part. The blow-molding industry has already begun to broaden the scope of product design from the original concept of round, hollow objects such as bottles. Many papers have been written to show the flexibility of this process in producing such items as lamp shades and children’s pedal cars. Blowing a unit, such as a housing, and sawing the item along the parting line to produce two parts has served both to increase the applications area and make production rates economicaL Multiple-cavity blowing is now a common method of producing several parts simultaneously. As many as a ten-cavitv mold can be run by using a wide tube and allowing the air to pass through a hollow sprue or runner system between parts. Subsequent fabrication will yield finished items. The blow molding of plastic bellows is used to add a dispensing function to plastic containers. This concept allows a more complete discharge of package contents than the normal round or oval squeeze bottle. The bellows may also be considered for industrial applications, such as a closed hydraulic or pneumatic system. The application of pressure to one bellows will be transmitted through the system to activate a second bellows or other control. A commercial television remote-control unit is actually in use today based on this principle. Multi-color extrusion permits the production of multicolor parts and adds decorative appeal to items without the need for post-blowing decoration. The design features of plastic are well known from the fields of injection molding and vacuum forming-Vacuum forming is unique, however, in the ease with which new designs may be evaluated. Simple wooden or plaster molds are adequate for the manufacture of prototypes- Blow molding is somewhat handicapped by the fact that a fairly expensive mold must be built before suitable parts can be blown. This problem can be reduced by the use of prototype steel molds that consist of a variety of inserts for such sections as the shoulder, neck, waist and bottom. The stocking of inserts for a common mold base will offer flexibility in checking design ideas in various sections of the part. The future design possibilities of blow-molded products appear to be extremely bright. The constant improvements in equipment design continue to add flexibility to the blow molding process- These same improvements are also leading to more attractive economics which in turn open up new markets. Raw material developments of thermoplastic resins specifically for blow molding are aiding in expanding products and product design.